Honestly bank earnings week has been a little boring, no? It&apos;s been quarters since anyone announced a six billion dollar trading loss, and the recent news is pretty much modest beats from a diverse mix of businesses and where is the fun in that I ask you. Financial-market memories are short and ... have negative serial correlation, or something ... which might explain why Goldman is down today despite announcing a $4.29 EPS vs. analysts&apos; $3.87, with strength in principal investments and debt underwriting making up for so-so FICC revenues. The call: variations on boring. Goldman CFO Harvey Schwartz painted a picture of Goldman clients who are deterred from strategic activity by macro uncertainty - "oh we can&apos;t do that merger, because, uh, Cyprus" - and so spend their time refinancing their loans every six months to get lower interest rates.1 I suppose their bankers have to make fees somehow. And there don&apos;t seem to be many conclusions to draw from the numbers: FICC revenues are down because there is noise in FICC revenues, not due to any change in business mix or performance. VaR is down because market vols are down, not because of any change in risk appetite. Private equity gains in investing & lending reflect stronger public equity markets because private equity is just beta. I guess. Nor is Harvey your go-to guy to fulminate about regulation, though these days really no one is. 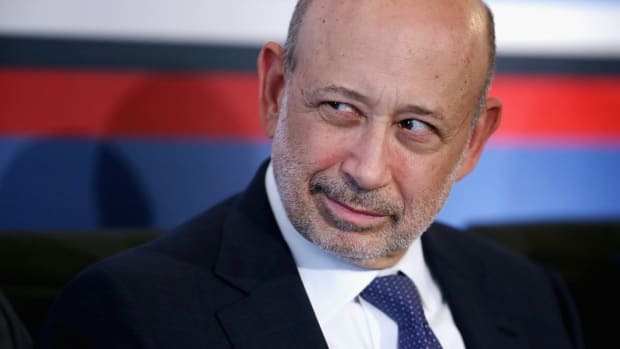 He said various nice things about how the regulators are working hard and getting it right, and how Goldman doesn&apos;t act in anticipation of regulations but only responds to them when they&apos;re final. Others have phrased this less charitably. Thus Goldman&apos;s new BDC is not a preemptive effort to fit prop traders into the Volcker Rule, but just a client-driven part of Goldman&apos;s asset management strategy - "deploying our competencies into opportunities we feel like our clients would benefit from." So what&apos;s left? There&apos;s comp, of course: comp accruals were 43% of revenue ($4.34bn), versus 44% in 1Q2012 ($4.38bn), and headcount is down 1%. Analysts tried to push Schwartz to extrapolate a trend there, but again he mostly resisted. Keep enough people to serve clients, etc. Still I was a little intrigued by one line of questioning late in the call in which an analyst suggested that "electronification" of FICC - things like trading of swaps on swap execution facilities - might lead to increased operating leverage, lower volatility, and higher returns on capital in Goldman&apos;s FICC division. Schwartz did not disagree, noting that Goldman&apos;s history with electronification is good, that the firm did well as equities and FX shifted to electronic trading, and that he sees the integrated SecDB system as a competitive advantage. In any customer transaction, a firm or its registered persons must use reasonable diligence to ensure that the purchase or sale price to the customer is as favorable as possible under current market conditions. FINRA found that Merrill Lynch had programmed a faulty pricing logic into ML BondMarket that only incorporated quotations published on the primary listing exchange for that non-convertible preferred security. As a result, in instances when there was a better quote on a market other than the primary listing exchange, that quote was not reflected on ML BondMarket. The firm instead executed 12,259 transactions2 in non-convertible preferred securities with its customers on ML BondMarket at prices that were inferior to the National Best Bid and Offer (NBBO). You can sympathize a little; retail preferred stock is a bit of a backwater and surely Brian Moynihan&apos;s top priority is not making sure that the computers are programmed to correctly reflect the interdealer as well as exchange markets in preferred stock. And a $1mm fine, and the abiding shame of having slightly screwed up some retail preferred-stock orders, will not exactly bring down the firm. Still there&apos;s probably a lot of this. You trade things by telephone and capture big margins. Those things move to electronic trading for regulatory and efficiency and other reasons so you build a computer system to trade them. The computer systems more or less work, most of the time, and occasionally they don&apos;t and you pay a small fine and cobble together a slightly improved system. Horrible disasters are rare. The next thing that moves to electronic trading, you build a new system for. Mostly, again, it works. But it makes each new move to electronic trading, each change in regulation and in the pipes that underlie the market, an occasion for fear and uncertainty and awkward jury-rigging. If you&apos;ve got a unified, consistent, well-tested system for keeping track of everything, then those changes are a bit less scary. They might even be boring. And I guess that boredom could be a competitive advantage. 1.Really, he told an anecdote that was like "I sit on our capital committee, and we see these clients raising debt, and then we see them in a strong enough position to refinance it in six, nine months," which, I guess you had to be there? 2.The release notes that, in addition to the fine, BAML has to pay $320,000 in restitution to customers, which means that the average customer trade missed the NBBO by $26. I can&apos;t decide if that&apos;s a lot or a little; like, $26 isn&apos;t that much, but what&apos;s the average lot size? If it&apos;s 100 shares (the maximum size on this ML system was 5,000 shares), then 100 shares x $25 par = that&apos;s like a 1% miss. I dunno. Preferred stock, man.